Today, 27% of consumers are willing to share personal data for more financial guidance and a more personalized digital customer experience. Of those consumers, more than 60% are willing to share data from their Uber, OpenTable and Facebook accounts; online/in-store retail purchases; and frequent flyer programs, etc. 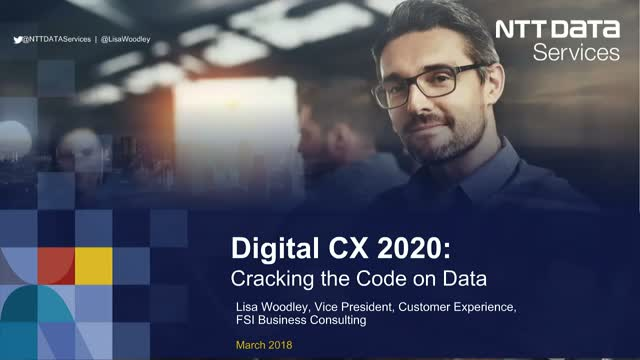 This webinar will dive into the findings of NTT DATA Services’ national research study entitled, “Digital CX in 2020: Cracking the Code on Data,” with customer experience expert, Lisa Woodley. SAP S/4HANA is the next generation ERP system from SAP that is replacing SAP ECC, which will be out of support by 2025. The question many of NTT DATA’s clients are asking is if SAP S/4HANA has matured enough to provide sufficient value to justify the move to SAP S/4HANA or if they should wait. In this webinar, Sebastian Gueler, VP, SAP Value Engineering, will highlight some of the value proposition of SAP S/4HANA 1809 as well as guidelines for how to develop a SAP S/4HANA roadmap including the identification of a business case and ultimately what signs to look out for to decide if it is the right time to move to SAP S/4HANA. Sebastian Gueler is a Vice President in the SAP Go-to-market group for NTT DATA. Sebastian has over 25 years of SAP experience having worked in Germany, South Africa, Australia, China, Mexico and the US, helping customers globally across various industries with their digital transformation journey. Sebastian Gueler - Vice President SAP Go-to-market group, NTT DATA. -Amazon, Facebook, Google: The future of banking? Join NTT DATA Services to learn how you can use a CRM system to move beyond a transactional and policy-centric organizational strategy towards making the one-on-one emotional and rational connections necessary for engagement. We will share our best practice strategies on how other health plans and other industries have aligned their CRM vision to their corporate customer engagement strategies for successful customer acquisition and retention results. • Learn: Using the current demographic data from enrollment, member provided data through member completed surveys and health risk assessments, call center interactions, claims information and wearable device integrations. • Listen: Using analytics and AI to capture, measure, analyze and evaluate the quality of outcomes of each customers experience throughout all interactions including social media, website and mobile device interactions. • Engage: How to integrate a dynamic CMS tool, integrate virtual agents and interactive guides to enable even smarter customer service and a personalized customer experience. Discover next-gen services built for speed. Gone are the days of multi-year application projects with the promise of vague business transformation. Join us as we unveil the next-generation of application services that are built for the speed of today’s digital enterprise. Mangesh as a pratitioner working with multiple customers, talks about the initiatives being undertaken, the types of tools, process fits and assessments depending on where customers are at on their RPA Journey. Arnaud Lagarde Strategic Account Manager, Automation Anywhere describes the content to be covered in the upcoming automation event on the 28th September at the CBR Dining Club with NTT DATA Services,relationship with man and machine,where companies are automating and the adjustments companies are making with software robots taking on the human tasks. CBR and NTT DATA Services Are hosting a dinner on the 28th September at the Ivy Restaurant in London.To bring RPA, IoT and AI to life, NTT Data is assembling a panel of experts including speakers from Banks and Insurance companies, AXA and AIG. See how market leaders rank and what you can do to quantify the customer experience. We all recognize bad customer experiences in the moment (think long hold times, non-mobile websites and repetitive questions), but can you quantify these experiences and tie them back to business measures? This webinar will cover a unique approach for identifying, quantifying and mitigating the experiences of your customers, partners and employees – the Customer Friction Factor service. We’ll share the results of a recent Customer Friction Factor study on 15 leading Consumer Packaged Goods (CPG) organizations and discuss how online retailers measured up as well. Gain insight on common causes of customer friction and learn best practices to apply to your own business. Join this informative webinar to see how we achieve superior test acceleration using NTT DATA's ML/AI based Intelligent QA solution. Our Software Test Acceleration Toolkit forays into Intelligent Automation space with its in-house built analysis driven testing engine, helping organizations improve their testing quality by taking better decisions. Turn your provider directory into an asset, not a liability. Comprehensive provider data combined with analytics can yield actionable business insights to help you improve member satisfaction and financial performance. You can track patients’ health, physician performance towards shared savings goals and understand network and attribution patterns. You can also see referral patterns and practice variations, benchmark physicians’ performance on cost and quality measures to help you improve member health and your financial performance. This session will explore the evolving use of consumerism practices and using advanced analytics to understand provider data and to impact satisfaction, retention, and outcomes. - Enable monitoring and prediction of provider performance via cost/quality metrics to ensure adherence to value-based agreements. This video discusses how to find a critical threat, advanced analytics and a skilled set of people are needed with the time, right expertise and skill set to fully understand the context and impact of a security threat. An overview of new technologies leveraging tradition, data, and insight to help make history. Insurance needs to stay relevant to the the changing way of life. Respecting privacy, accepting everyone is different, allowing for always on, and broadening support to the customer with money advice via digital media. These innovative new technologies improve the customer experience, increase customer interaction allowing to cross sell and upsell new products and services, reduce claims, and make buildings smart and help create and archive of digital assets with low risk and fast role out. We’re the IT rock stars. NTT DATA Services goes beyond the traditional services provider. We are a top 10 global IT services and consulting provider that wraps deep industry expertise around a comprehensive portfolio of infrastructure, applications and business process services. We focus on the insights, solutions and outcomes that matter most to clients. We invite you to explore our channel.